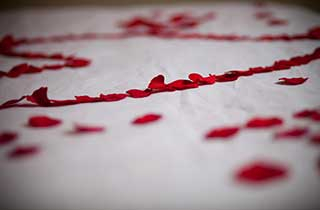 Enter your candlelit suite filled with the aroma of one dozen roses and silk rose petals in a heart-shape on your bed. Enjoy 2 in’spa’ration aromatherapy packets in your whirlpool tub while sipping on your choice of sparkling juice or champagne. Oh, and sleep in, your checkout is 1pm. Why rush the romance!